Wednesday through Friday of last week, Don and I were privileged to attend events at the inauguration of President George W. Bush. What an adventure!! As I stood in the cold with hundreds of thousands of people, all facing the United States Capitol, to listen to President George W. Bush give his address to the people of our nation for his second term as the most powerful individual in the world, my heart swelled with pride for the heritage of this country. For that moment I could forget the protestors and rampant sin in our land and think of the many, both past and present, who know the strength of our nation is bestowed from the graciousness of Almighty God. The invocation, given by the minister of the Episcopal church close to the White House and where President and Mrs Bush attend when they are in Washington, exalted and thanked our Merciful Father. The military band, with full sound and fanfare piercing the cold air, played God of Our Fathers as if the entire nation knew the words to that gorgeous hymn were absolute truth. And the pastor from Texas who delivered the benediction exclaimed his petitions in the name of Jesus Christ, our Savior. No one would ever have suspected that the week before the Supreme Court of our land was asked to remove prayer and God from the swearing in of our leader. As the crowd began to leave the area, I saw two young men with a sign. Protestors were everywhere so I wanted to see what their placard read. 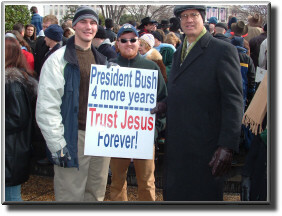 A little to my surprise, it said, “President Bush 4 More Years, Trust Jesus Forever”. I took their picture with Don!! And thanked the Lord for the next generation of those who will keep our nation a nation who loves God. Deut. 8:10 reminds us to never forget that it is God who gave us this land.